Here we go again! 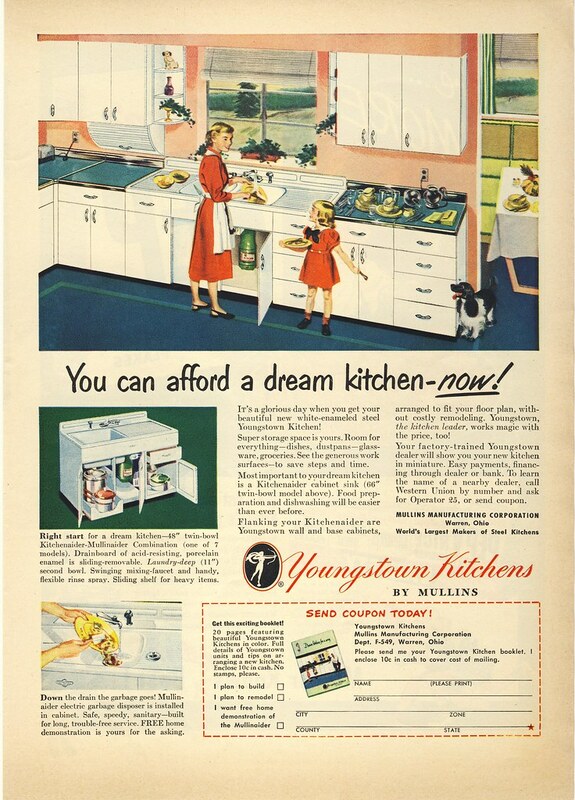 Lets see those vintage advertisements for Refrigerators, Stoves, Washers/Dryers, Radios, Phonographs, Televisions,Vacuums, small kitchen appliances, gadgets...hey everything AND the kitchen sink! Lets take a trip down memory lane. Special thanks to hubby (Catalanman) for links. What happend to the Wizard brand? What it became, or who acquired the brand? Wizard was a line from Western Auto made by a few different appliance companies through their years in business.They are now defunct but,I don't know how long ago it was they went out of business.Their laundry line was made by Norge in the later years and Franklin in the earlier years.I am not sure who made their ranges and refrigerators. 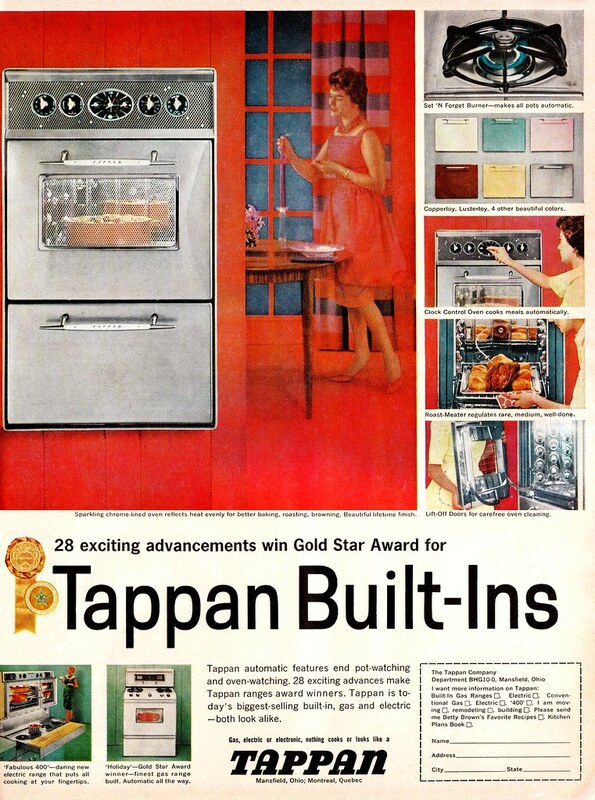 may have been Gibson and Tappan? 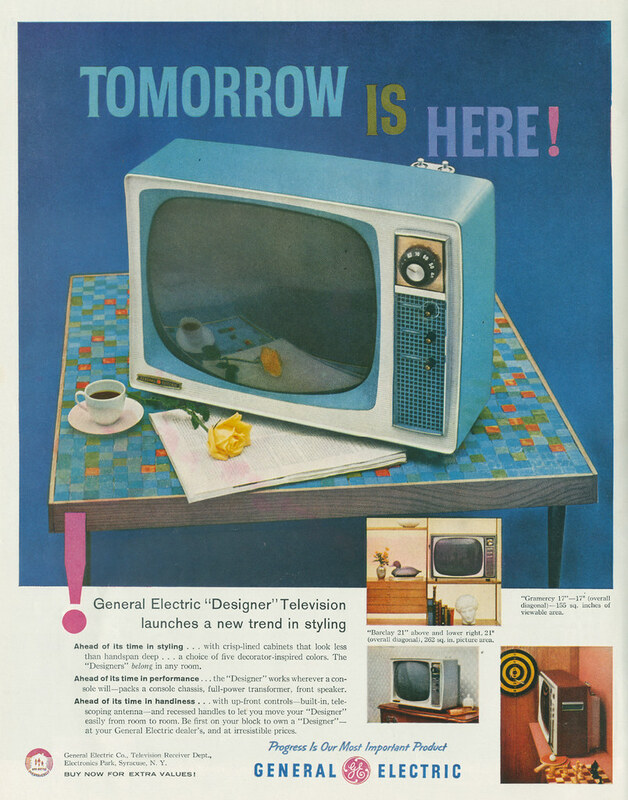 We had that exact GE television when I was a kid! Whenever I remember watching Rocky and Bullwinkle, Axel in his treehouse, or Lunch With Casey I always see that turqoise "frame" around the picture! 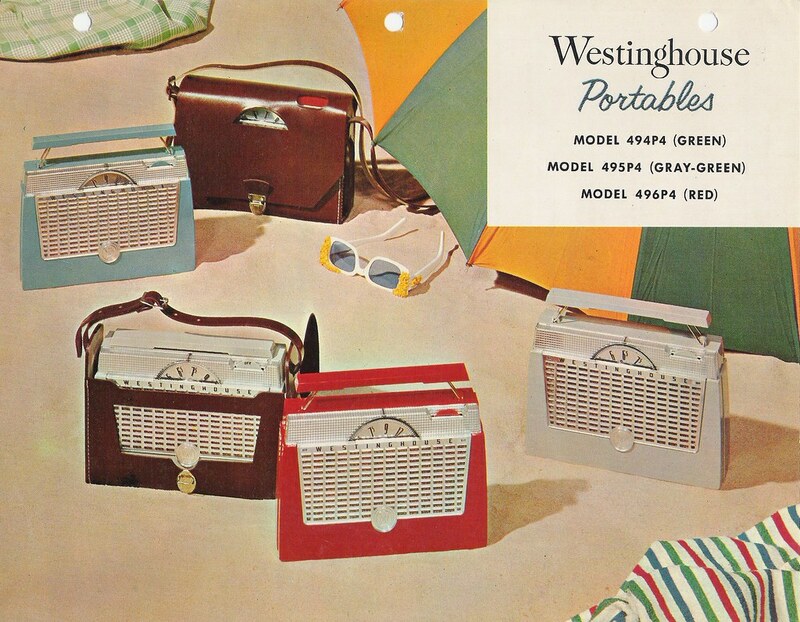 I have my parents radio in Red like th One in the picture model 496P4. Still works. The "Sheer Look" is so HOT! 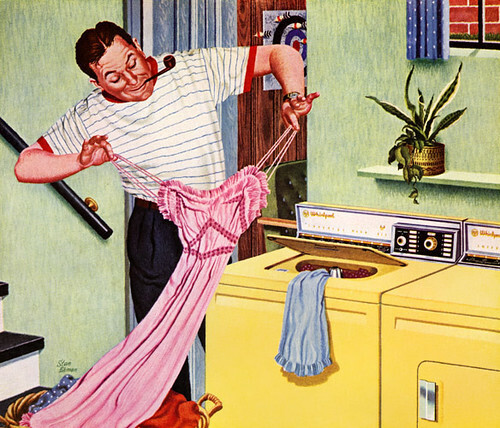 I have the Westinghouse iron! It was my mother's. Still works well, too. 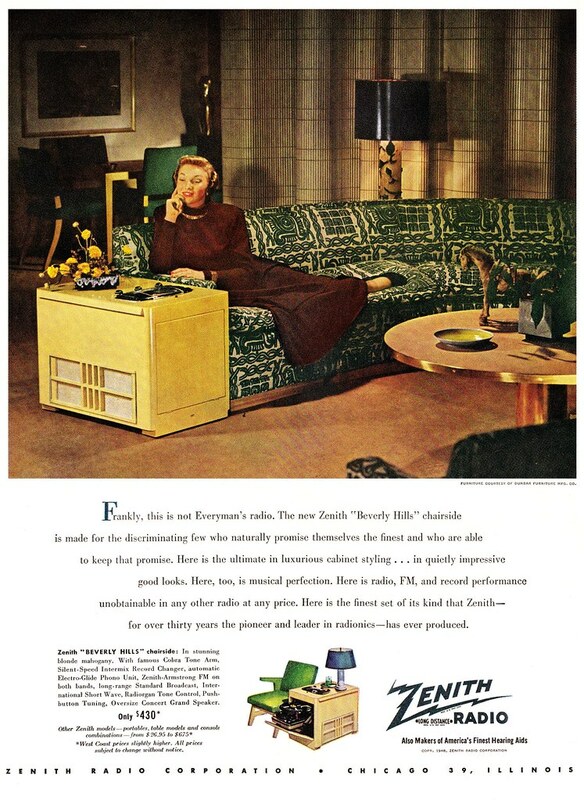 Here is an 1968 ad for my downstairs Zenith console stereo. Wow Joe! What a fantastic Zenith! Caption should read, "Frank gets all frisky when I slip this number on." LOL! Thank you "laundromat" for the answer. And thank you "Ultramatic" for all these great Ads. 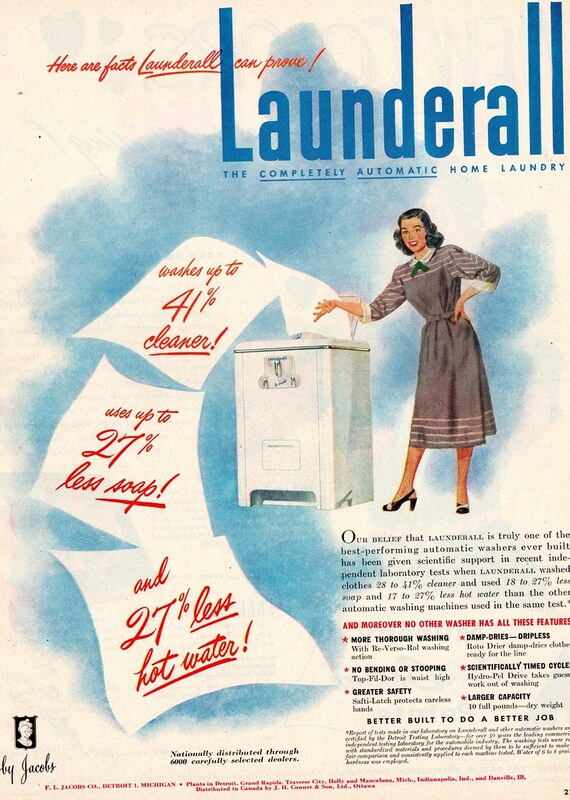 Ultramatic do you have also some old Ads of laundry detergents? Cool Louie, I appreciate all of the cool ads you are posting. Permission is granted to link to web pages on this site, but linking directly to files (including but not limited to jpg/png/gif graphics, mp3's, executables and zip archives) is strictly prohibited. Any other use, including but not limited to the reproduction, distribution, display or transmission of the content of this site is strictly prohibited, unless authorized by JonWilliamson.com. This license shall automatically terminate if you violate any of these restrictions and may be terminated by JonWilliamson.com at any time. Reblogging or reposting content from this site is acceptable only if a link back to the original post on JonWilliamson.com is included. The only other ads that cannot be posted are those that I created and are in our current rotation of the Picture of the Day. I will make an attempt to remove the images that could be an issue, which is going to take me of time, so please do be wary that if an ad is watermarked to be sure you have permission from the original creator to post it. Copyright issues on the internet is something we have to take seriously. Cool Robert, thanks for the heads up. I'll keep an eye out for copy righted material. I'll start removing anything with a water mark. I seem to remember what you post in Picture of the Day, I always look first thing in the morning, thus I'd never knowingly post something that was there originally. P.D. I've corrected the one's in question in Part Two, but unfortunately I can no longer edit the ones in the first thread, sorry. No problem what so ever Louie! Thanks for the updates. There have been lots of problems recently on many websites especially with the Righthaven and Getty Images law suits (if anyone is interested google those two companies) that have shut down some mom and pop web sites, so I'm just being extra cautious. Thanks for understanding, your posts have been absolutely fabulous. Along with "stock photo" shops the world over are getting very testy about persons uploading and or otherwise using their content without consent. It explains why so many now watermark images to the point you can barely see them clearly anymore. Ebay sellers and website designers on the cheap probably were are some of the biggest culprits of lifting prints/content for their own use. OTHO can see their point; afterall these places make their daily bread by selling use of content/photographs not to mention any agreements they have with the original owner or photographer than entitles them to a piece of the action as well. The Internet has changed in these ten years or so and what was once deemed "ok" even if marginally often no longer flies today. Technology and programming have also advanced in that content and photos can be prevented from copying/pasting as well. 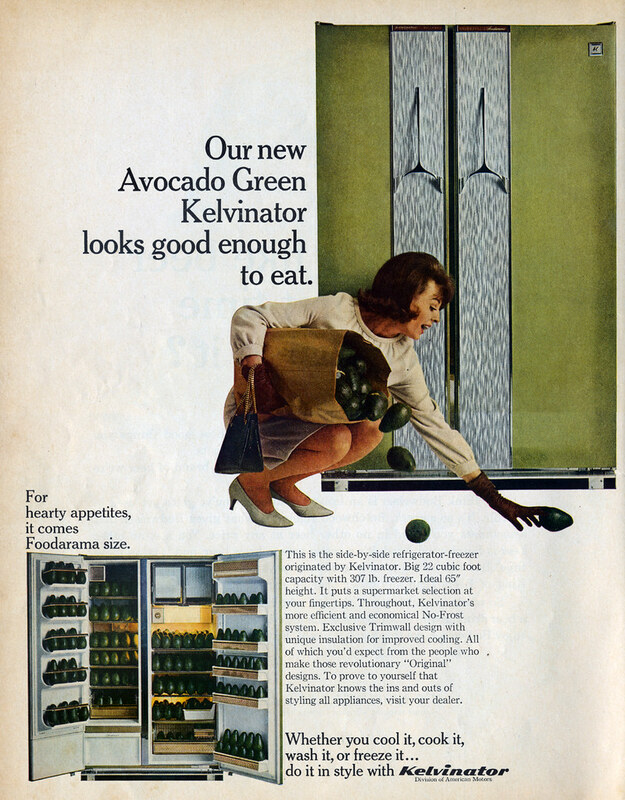 Wonder if that's the way a Side X Side version of my grandparents' old 1969 Kelvie top freezer model (also in avocado) would have looked? Love what I'm seein' (here & in the other gallery, too!)...!!!! More to come Dave, enjoy! Sure would LOVE to have one of these today! I have this one, and still use it regularly. If some websites are picky about people lifting their images just a few lines of HTML code would stop that by disabling the copy feature of the viewers browser for as long as they are on the website. It isn't that hard. This one uses . Oh yes the Dumont Royal Sovereign. 30" and $2,000 of 1950 tech. This set has an amazing picture for the size and age of it. It is also a truly MASSIVE set! 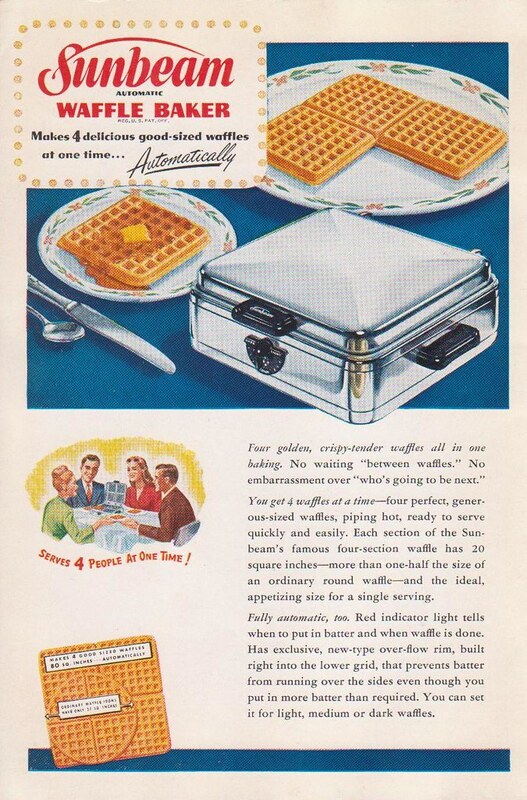 I dont' see how anyone could stop me from finding one of these advertisements in a magazine, scanning it myself and using it.It is all either public domain now or still under copyright from the original manufacturer like Seagrams. I don't see how Jonwilliams can copyright a Seagrams ad no matter how old. Seagrams and its logos are still in business. "He" can copyright his site content, which he can prevent people from lifting and using, and we shouldn't do that here. If jonwilliams has a FORD ad and tries to control its use he'll be in big trouble from a big company. I know , I have permission to use the Ford logo for small runs only, direct from their CLO. Ford controls all use of the Blue Oval for sure, not some bojack Texas photographer. I can see if someone scanned these as content for their site and copyrighted the whole site content , and we accessed their site content yes thats protected. But the actual ads themselves no, thats bojack. So scan your own , take no money for it and avoid the bojack websites! BTW nice ads, love that DUMONT tv, Royal Soverign love the name. 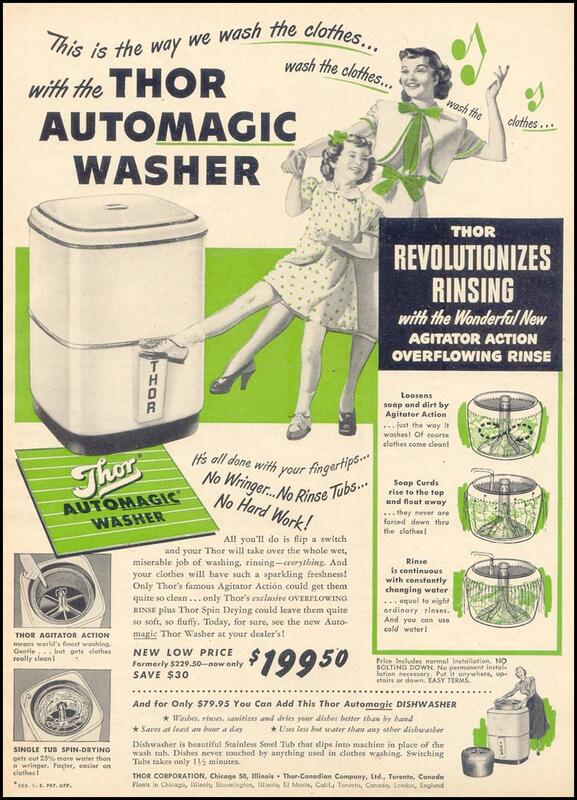 Its like the Coronado Imperator washer! This post has been removed by the webmaster. 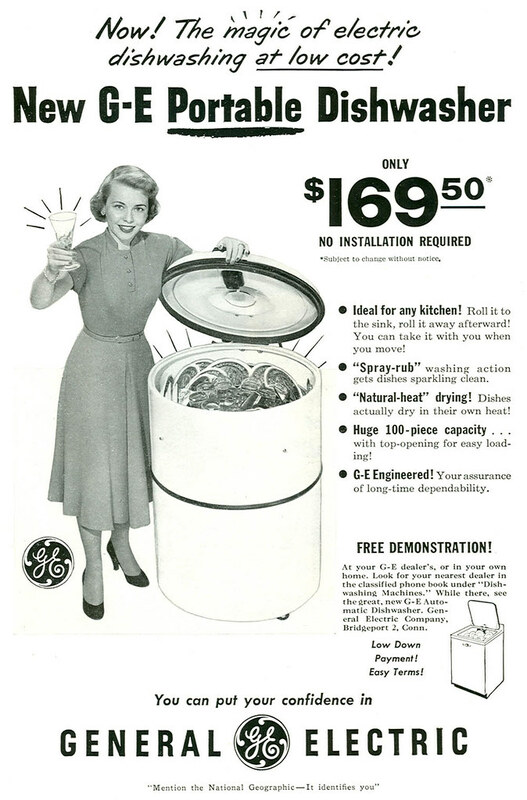 Does anyone know whether these dishwashers are still in existence? 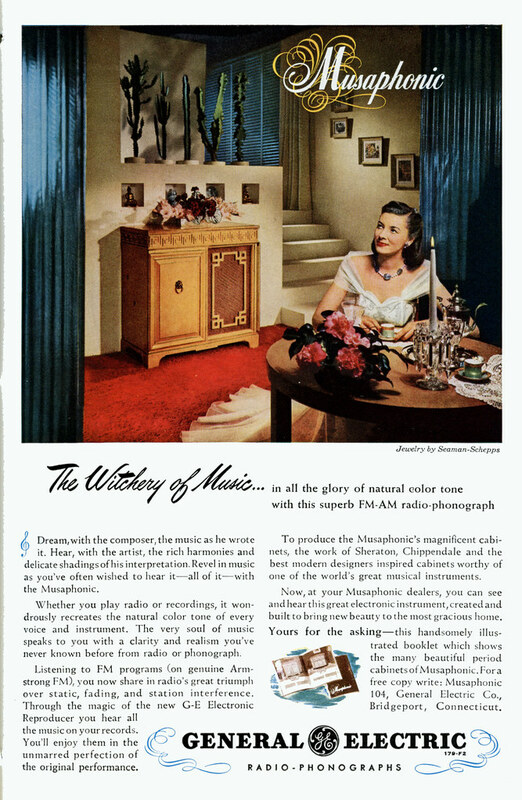 I love their Decor Ads, so elegant and tasteful, and even very stylish today. 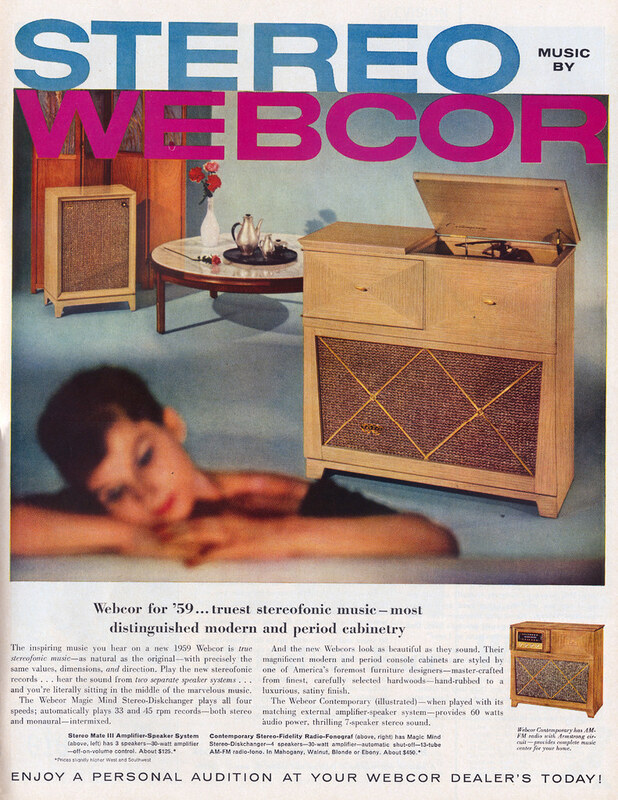 I have a 1956 or so hi fi console with a "Rangoon Bamboo" grille. I thought Robert asked you to not post watermarked images, the GE has the jonwilliams water mark at the bottom. I remember when Nancy Smith had her's delivered new across the street! 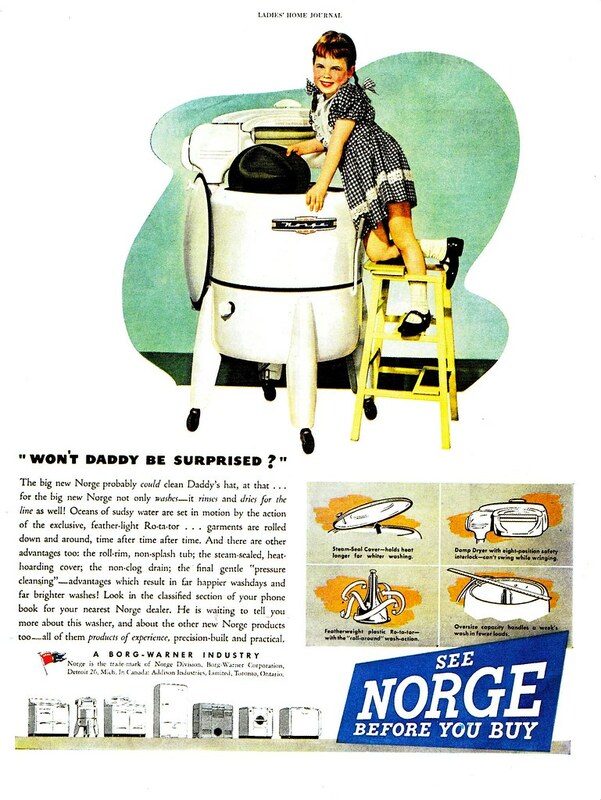 She replaced an oil leaking 1953 machine and boy was that futuristic looking! 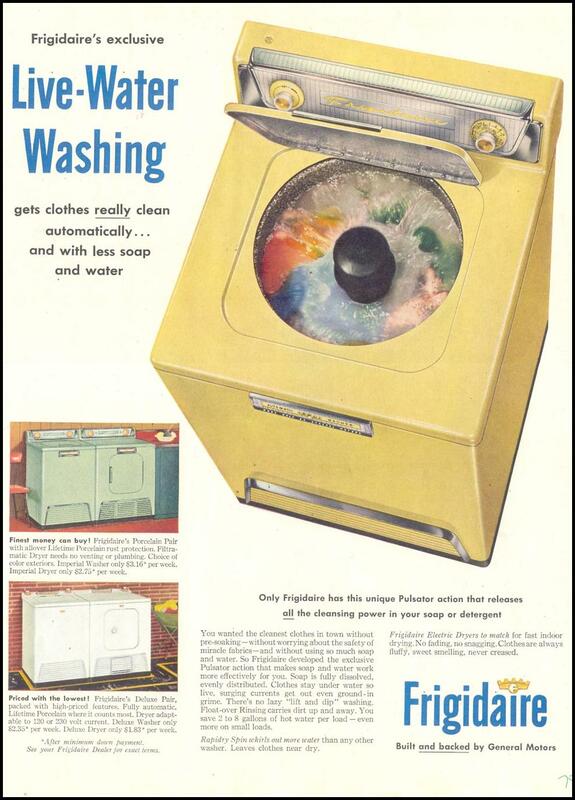 I had never seen a florescent light on a washing machine before, it gave me dreams! thanks for catching that Jon. Awesome as they are, the Predictas are prone to trouble. All of that heat being generated inside a small box got everything frying in fairly short order. Most restorations involve a peripheral fan to keep things cool, but generally it's not a good idea to operate a Predicta for too long at a time. My guess is that the "barber pole" models are the most difficult to find. They looked to be extremely top-heavy and entirely inappropriate for earthquake country households. 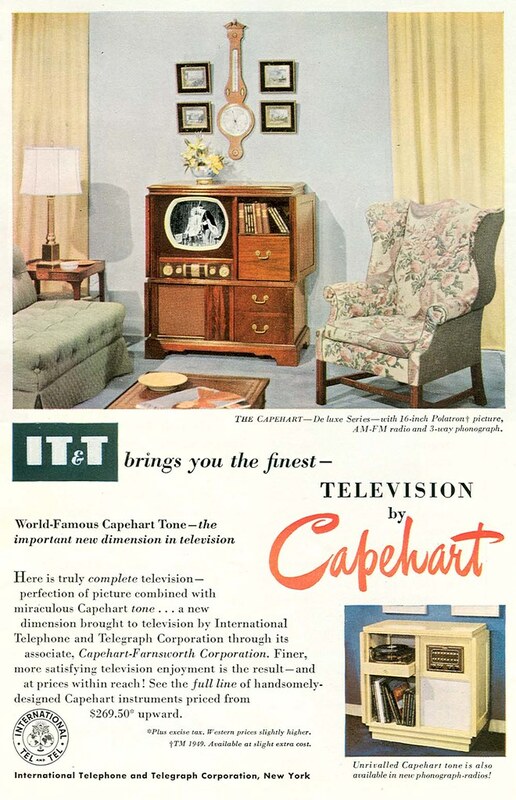 We had a 1951 Capehart for our first TV. Model 325-F in a maple cabinet. 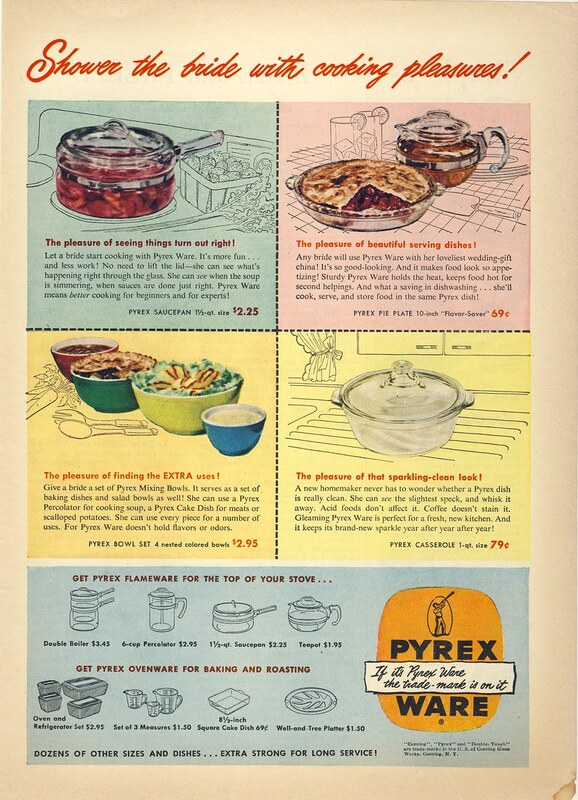 From the dates on the ads above, it appears that 1951 was the first year Capehart offered a rectangular screen. Ours was big and heavy, and was hard to justify saving as a result. I sold it as part of my mom's estate sale a few years ago. It's also a much more complicated than average set for its day, and would require a more involved and extensive restoration. That 30" Dumont is impressive. I'll bet it's downright impossible to find replacement CRT's for those. Many sets of similar vintage that have small screens survived with good CRT's because by the time they started to have problems, the CRT had plenty of useful life left, but most people opted to buy a new set with a larger screen rather than fix the old small screen one. 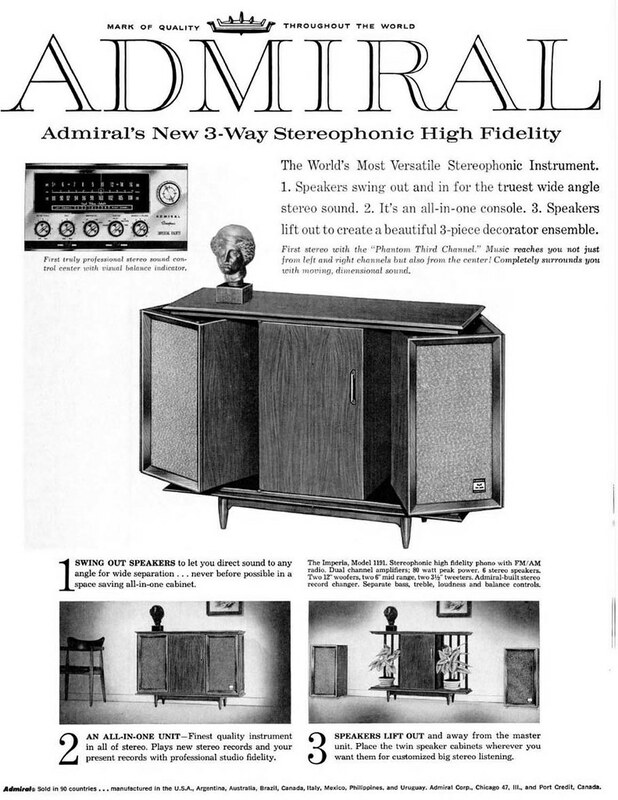 Lucky for people like me, sets like my 1950 Admiral 10" bakelite "Consolette" was sent to the attic or other storage space for the next 25 years before landing in a thrift store. I got mine for $5 in 1980 and had it re-capped for $100 several years ago. It sits in my guest room now and I will watch it once in a while. The technology is primitive, and even on a 30" Dumont screen there would be compromises with level of contrast from scene to scene, so early TV's are best appreciated for what they are. About 20 years ago, with a heavy heart, I had to throw out my folks 1966 DuMont color console. It was our first color set. It had suffered some damage in the NYC blackout in 1977 (the picture became out of focus). 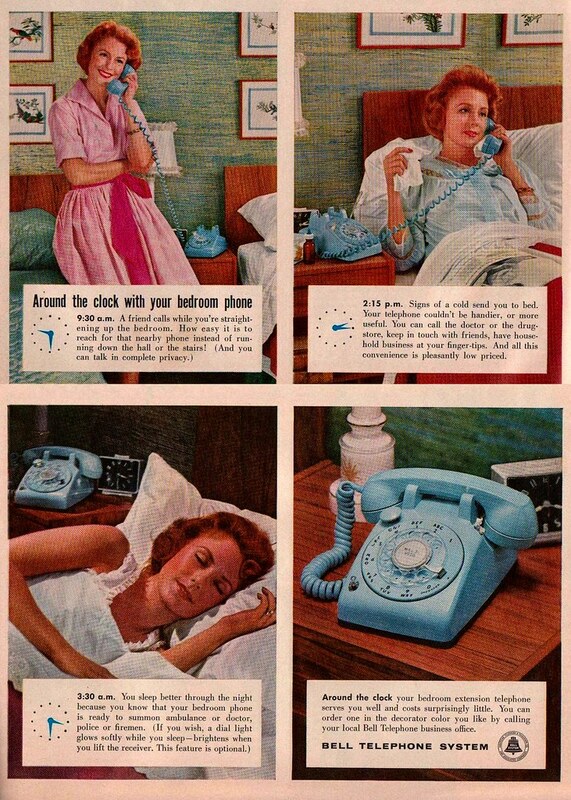 It was replaced with a new Zenith. Initially the DuMont went into the closet to be repaired "someday", the cabinet was so beautiful. But it never was. Finally I had to get rid of it because the space was needed. If I knew then just how rare that set is today, I would had NEVER gotten rid of it. 30" DuMont-didn't think such a critter existed in those days until I saw the ad-bet you need a FORKLIFT to get that TV into your living room-the cabinet doesn't have pockets for the forks?Hate to manhandle that set into a house.I found a much smaller older Dumont set by the side of a road in Baltimore years ago-found during an AM station RF proof doing feild strenght readings.Found a total of 3 TVs that day.Found two others in trash piles waiting pickup.Rogers car was full of TV's that day.Dropped off the sets at our houses afterward.Temporaily stored my old set collection-many found in dumpsters-besides the DuMont-had a console Philco and working remote-from a dumpster.A Motorola set from another dumpster-and it worked,too.The DuMont was fine-had sawdust in it.Vacuumed out-agin just find.I had these stored at a radio station transmitter site temp for a move. the site was broken into,my sets,Joes,and Rogers were stolen along with some other equipment not tied down.Only thing left was the RCA 5H AM transmitter becuase it was large,heavy,operating and hard connected.I haven't tried to rebuild my set collection since then.All of our sets worked-the theif got quite a haul-guess he had a large truck to haul them in.And its was cool to watch the "Thing" from Laserdisc on the DuMont-it looked rather spooky played on that TV. whats happend to RCA? 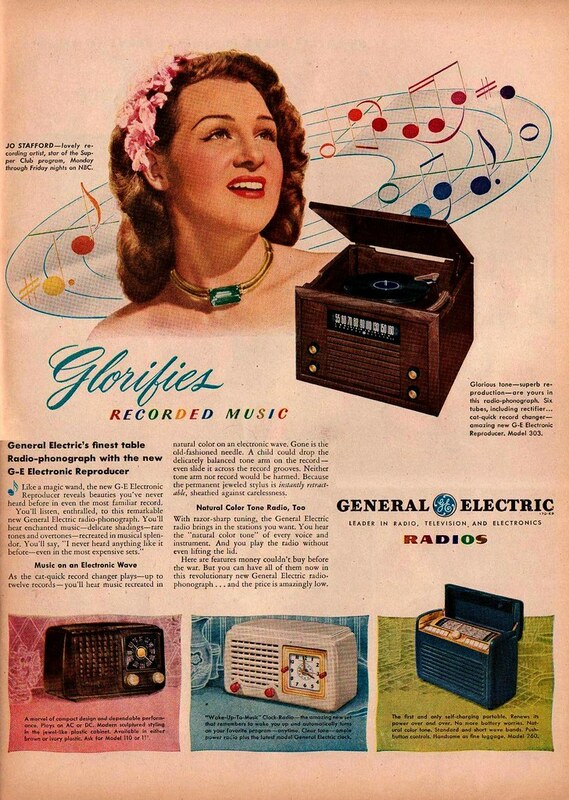 They made the best IMHO color televisions, they made records ,had broadcasting studios, made radios. 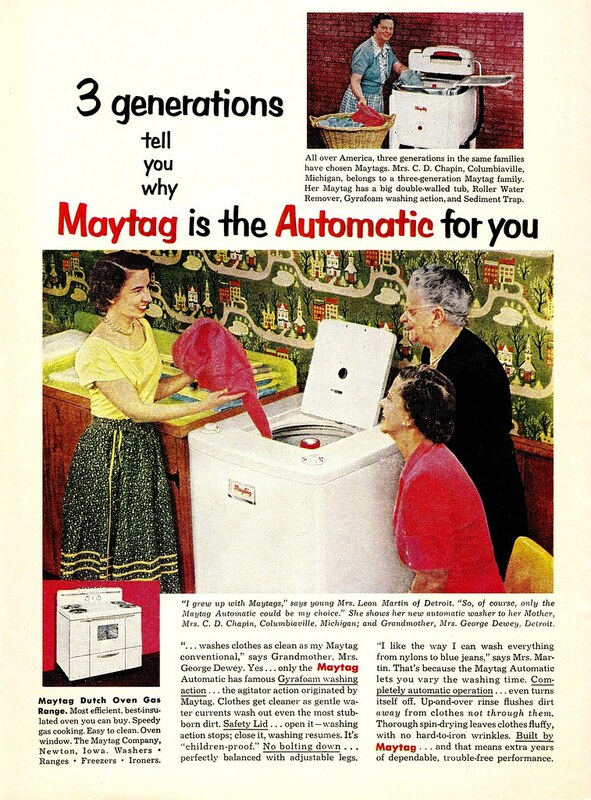 They even made washers for a time! 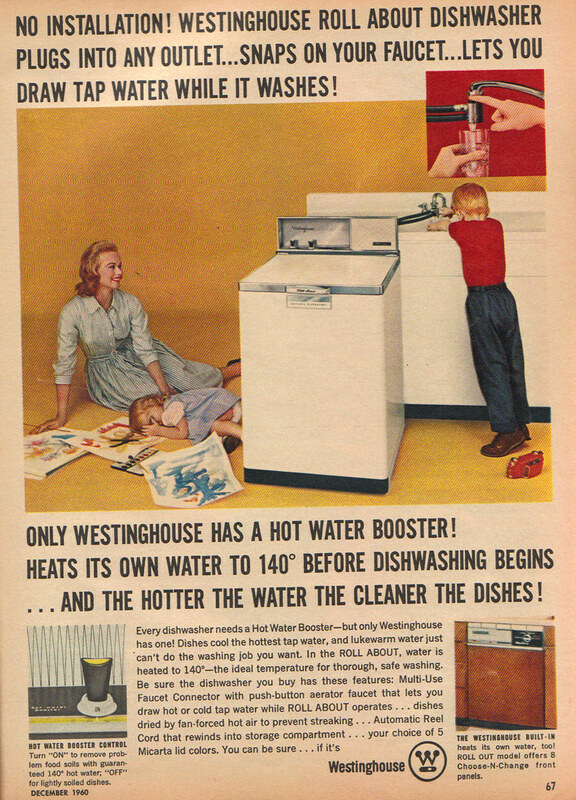 Westinghouse Portable DW & Sunbeam Mixmaster Jr.
We had the exact Westinghouse dishwasher when we moved to North Babylon from Long Beach, where we had no dishwasher. It did a great job, too. 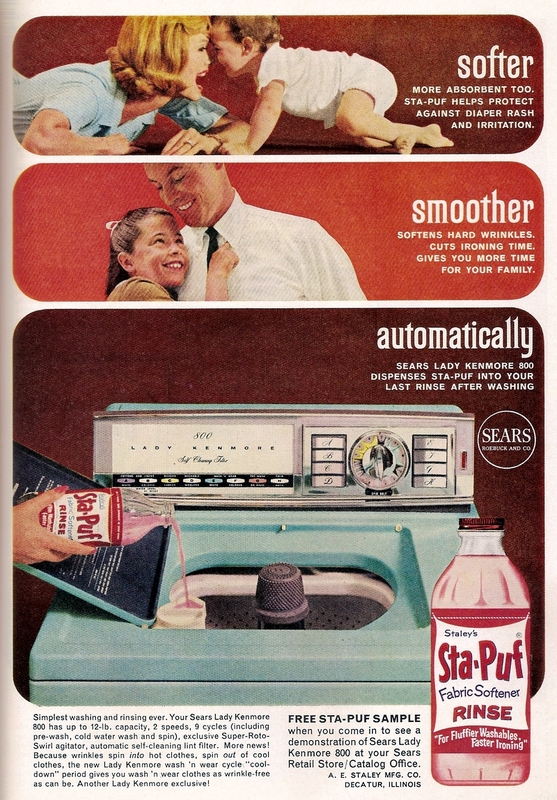 We still have Mom's Sunbeam Mixmaster Jr. and it works fine, just nobody uses it! And they also made mainframe computer systems in the 60's & early 70's too! 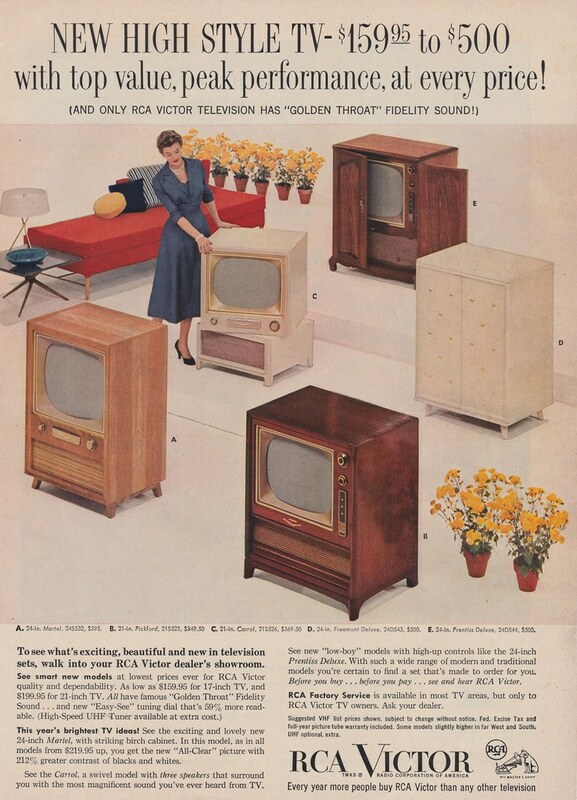 They were called the RCA Spectra Series. But sometime in the early 70's RCA exited the computer market. RCA carried on until around 1986 or so when GE bought them and the NBC television network which was always closely associated with RCA. 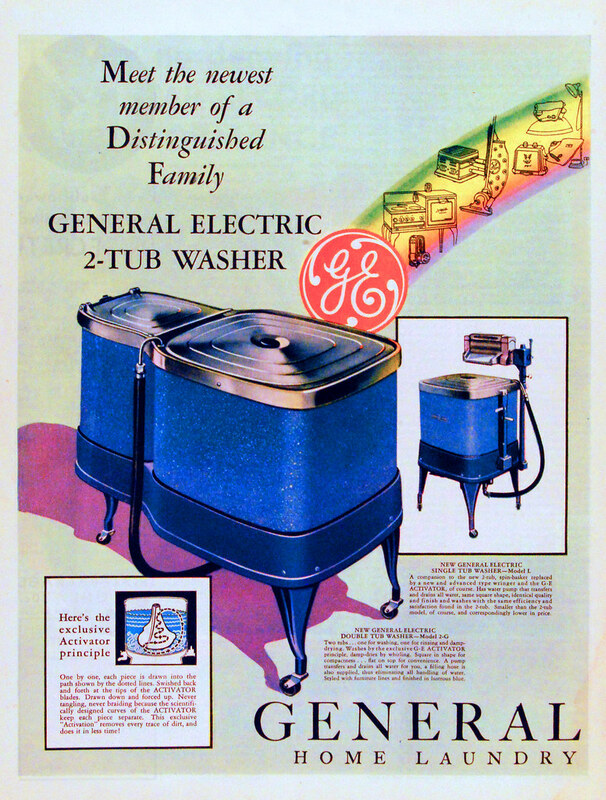 GE then sold the RCA consumer goods to the French company Thomson. Then RCA records was sold to the BMG music group. Eventually Sony Music took over BMG and simply rolled BMG into the Sony music family thus ending RCA records. 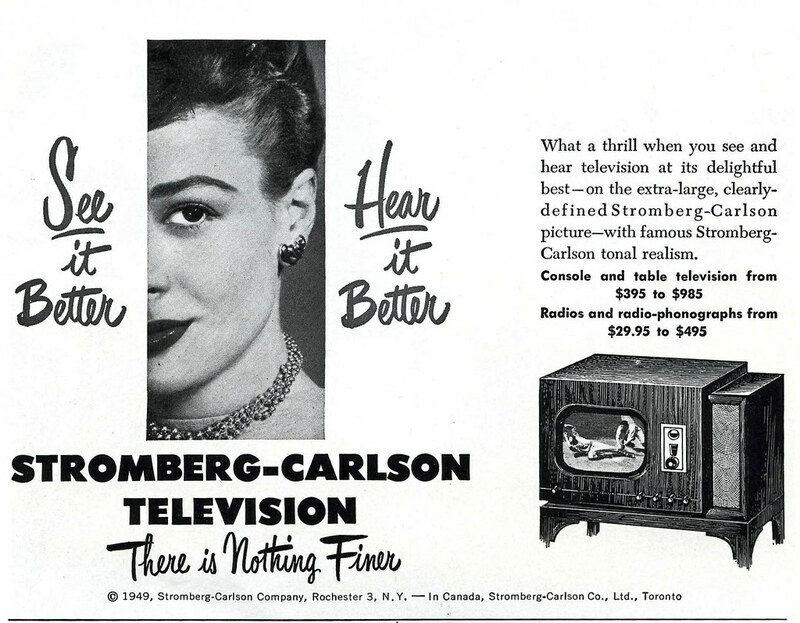 In 2010, Thomson sold the rights to the RCA consumer goods (television, car stereo, etc.) to the ON Corporation. On currently manufactures televisions and other consumer electonics under the RCA name. I really condensed this for the thread, there are quite a few websites about RCA history. As one can see, RCA is only a mere ghost of what it used to be! 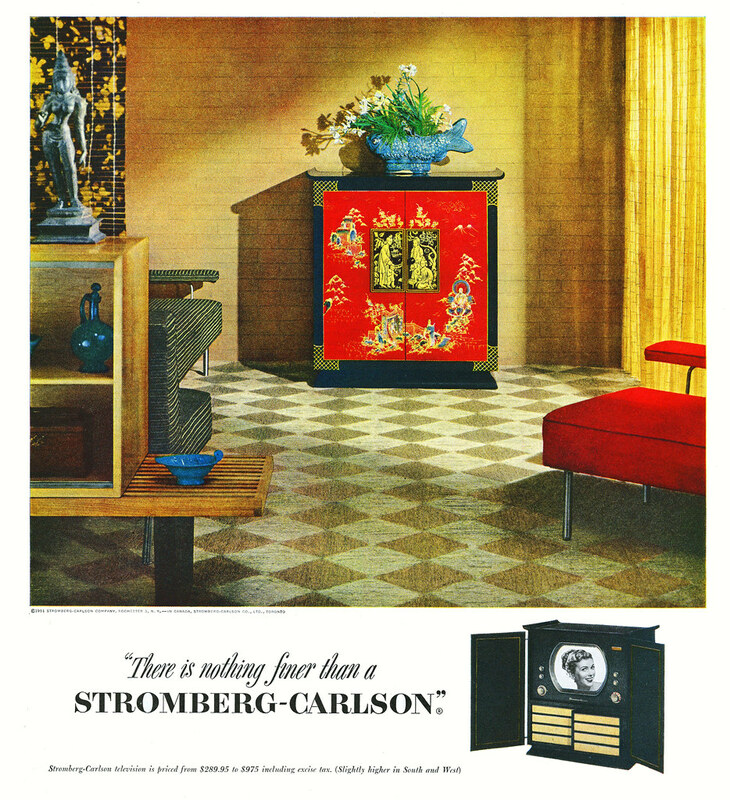 My aunt, uncle, and grandmother who all lived together had this television with the oriental figures in relief. The painted portions of the cabinet were all black. It was kept for decades after the TV stopped working. All have passed on now, but my cousin still owns the house and contents. I should ask whether the TV is still around. Dealt with RCA broadcast equipment A LOT at one time-they were the king.Now its Harris.RCA equipment was well made-and pretty easy to service.Parts were easily availabe-even for older RCA equipment-now its all gone!Harris and Contenetal electronics sell most transmitters and broadcast equipment now.continental is an old company like RCA-they also build a lot of equipment for the Gov't and military-their main factory is in downtown Dallas,Texas-have been thru it.Harris is based out of Quincy,Illonous.the old RCA broadcast factories in Camden,New Jersey--have been torn down. Tom, if that S-C set is still in your cousin's possession, and if he or she is willing to part with it, there's a strong possibility that the CRT is still good and all the set needs is to have its capacitors replaced and perhaps a resistor or two. The tubes are likely all fine. The guy that fixed my Admiral advised that tubes rarely go bad. I have a directory of guys who fix old TV's and radios and I believe there's at least one guy in the Phoenix/Tucson area. My Admiral's re-cap job came to just under $100 for parts and labor. 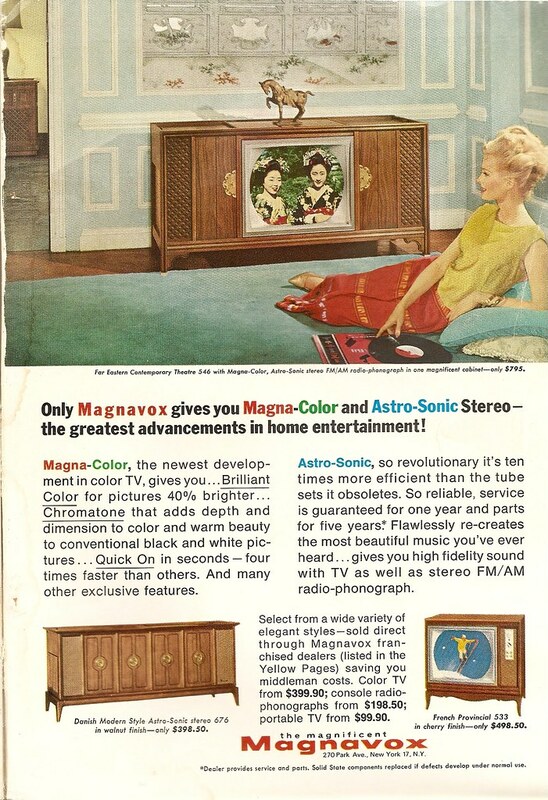 Your aunt & uncle's S-C set probably isn't worth a whole lot as is, even to a collector, but it's likely worth more than the average console from that period because S-C produced some of the most beautiful cabinetry ever to contain a television set. It would be worth getting if it's up for grabs, if you have room for it, and if you are interested in getting it back up and running. RCA, later Thompson, design office was on US31 just north of Indianapolis. The built their office to look like a radio. It apparently has moved, the building is now part of a health network. Here's what street view shows. 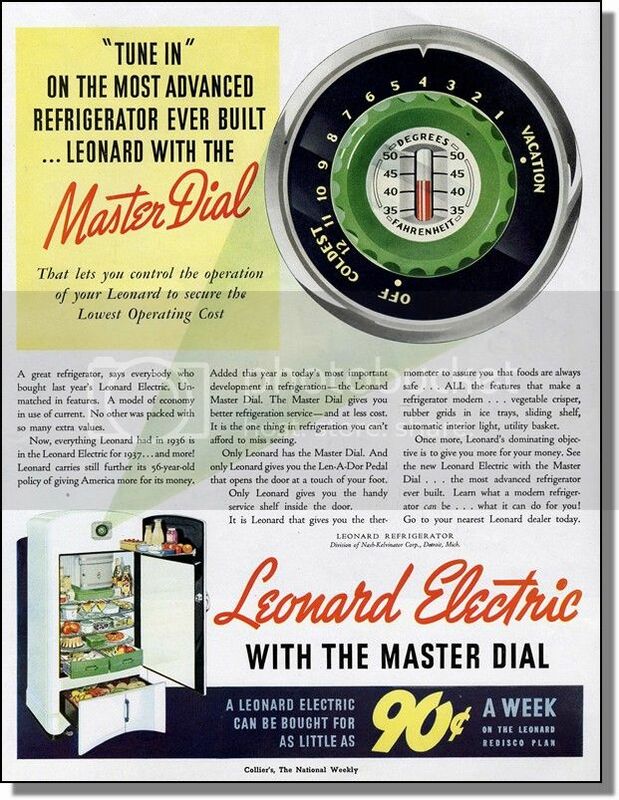 Growing up we had a Leonard refrigerator in our home. It was a 2 door model with the freezer (self-defrost) on top. 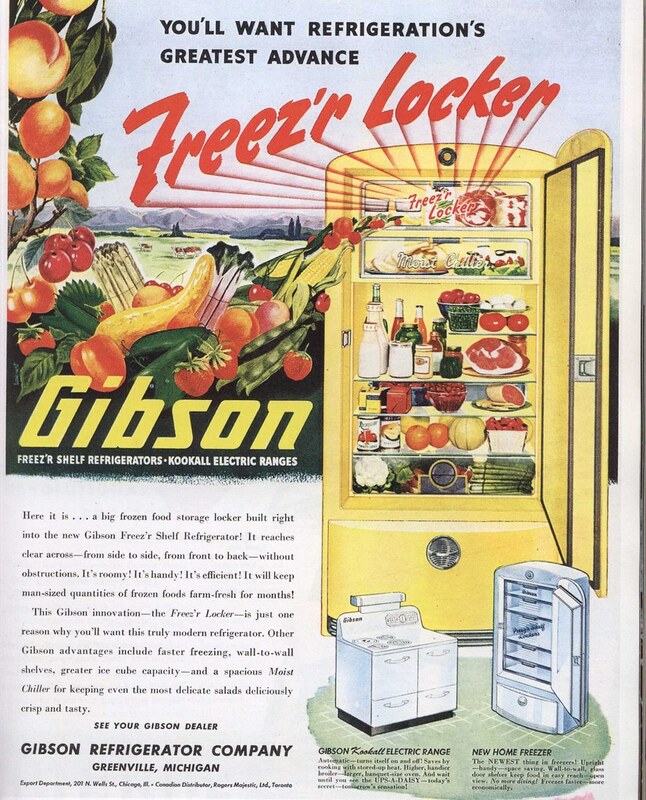 It is still in use as a 2nd fridge in my sister's home so that would make it about 45 yrs old. 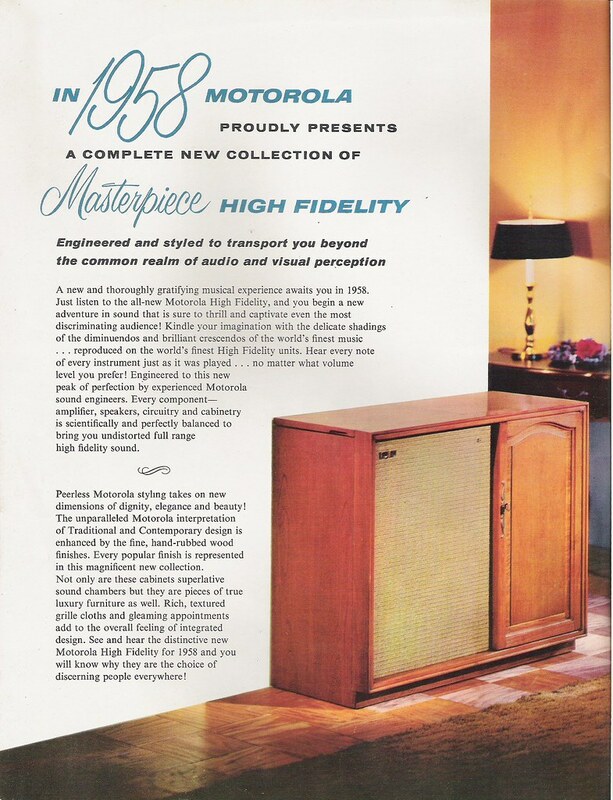 Not just any 500 set...this one has a "dial light"
I love that 1958 Motorola in Reply#60, sometime not long after, they would use Drexel cabinets for their console audio and television. Try finding a tv in a Drexel cabinet now. 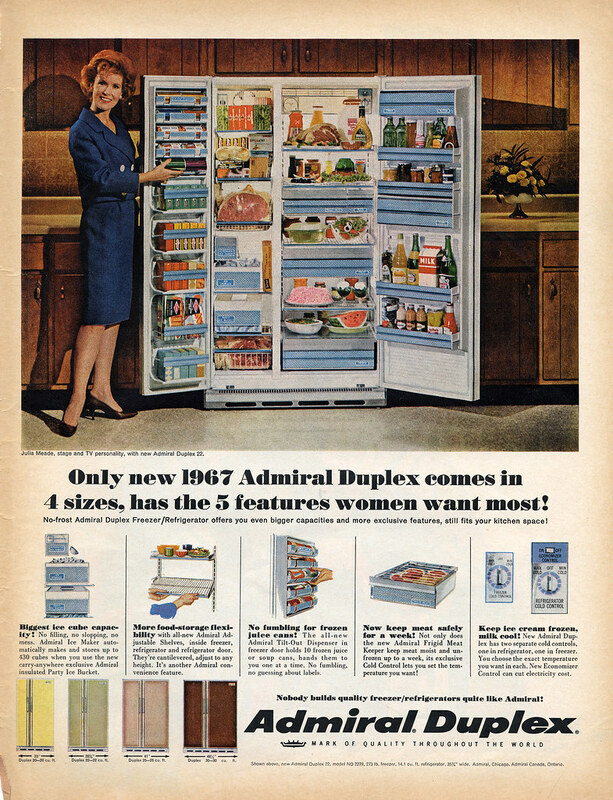 Friends of the family had that Admiral Duplex in the largest size. 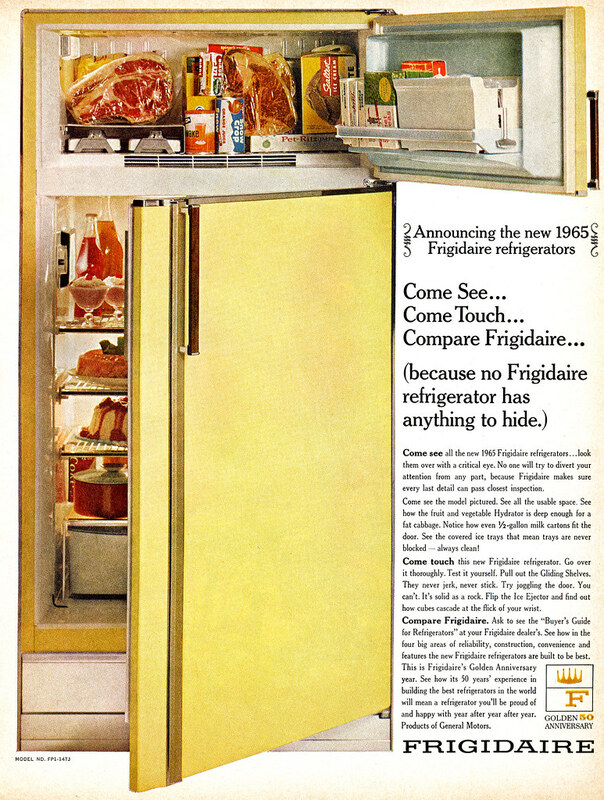 It was Coppertone just like the one in the ad, and had to be the largest refrigerator I've ever seen in a house. I had forgotten Admiral had the edged light tan color, like Kenmore Doeskin. I have a magazine with this ad, but haven't looked at it in a long time. 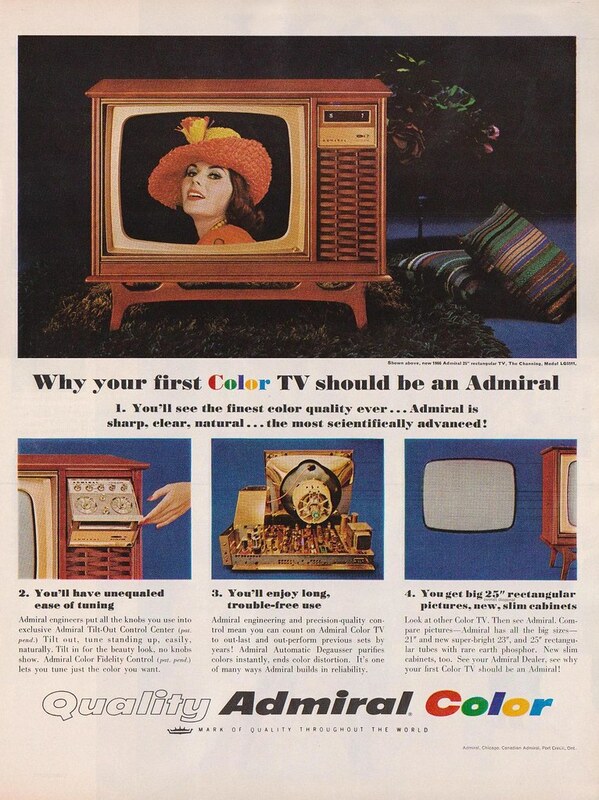 Those tilt out control panels on Admiral color sets were very popular. Admiral seemed to be on a roll in 1965-67. The had a huge lit up sign in I294 in Schiller Park,Il. near ORD. 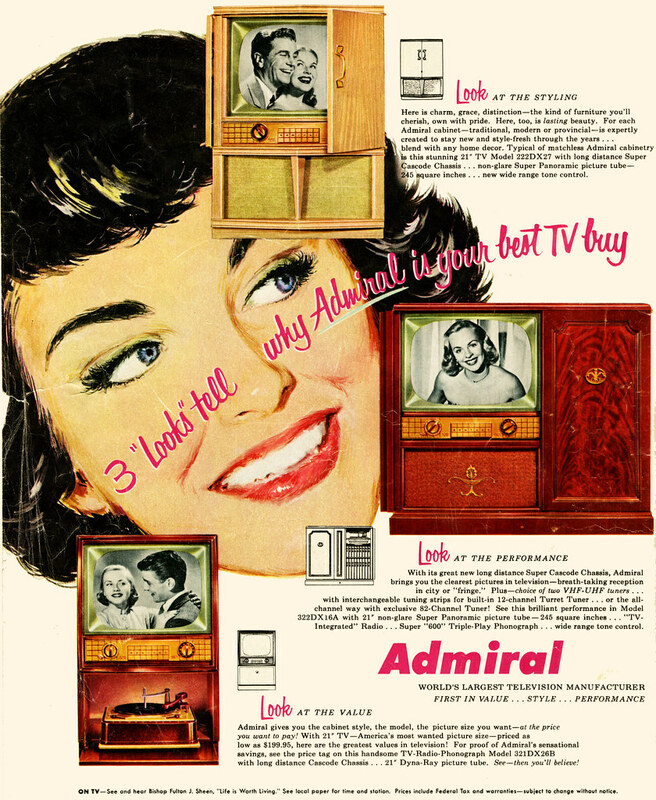 I had heard from a TV service guy around the mid 60's that Admiral sets had quite a few failures resulting from the movement of the pull out control panel. Anyone else heard the same? And Motorola had the "Works in a drawer" where they had modular parts (similar to Zenith's System 3) on a roll out drawer. It seemed those were around for only a few years. 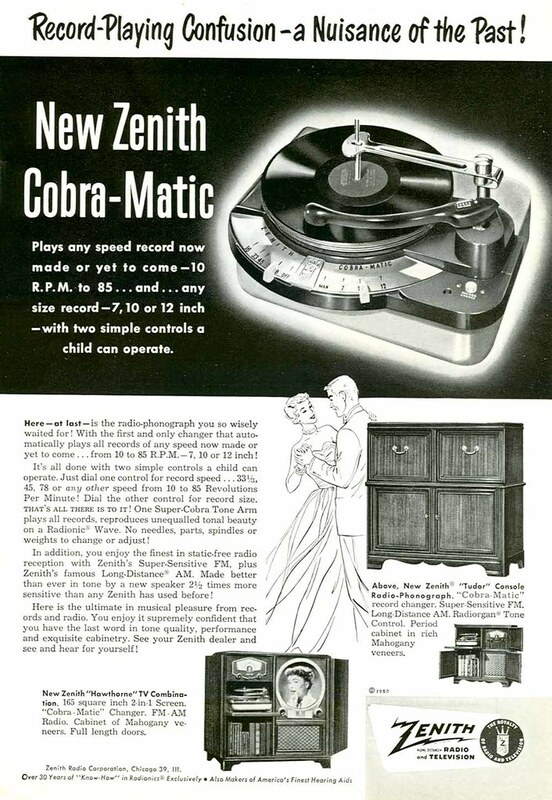 That Zenith photo/radio set in the ad above was very popular in audio/visual depts in schools in the 60's. Along with VM reel to reel units. Have you noticed that advertisers like Zenith and Cadillac never use the term "discriminating" for their potential customers anymore? I've only encountered two Admirals with tilt-out control panels. Always wanted one as I thought they were elegant. The quality of their flybacks was not too good. One I found at a TV shop who was selling it for $10. When I went to buy he fess'ed up that the fly had burned up... totally toast. 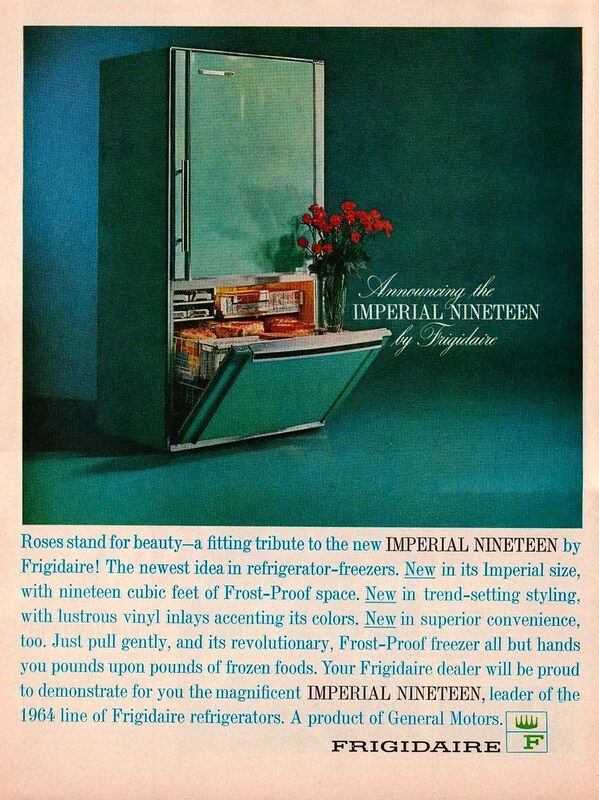 Regarding Admiral refrigerators: A nun friend had one at a convent. It was an avocado Custom Imperial and it was absolutely massive. is gorgeous beyond belief!! What a machine mama! Totally a Zenith product and service. Don't have any data on it personally but I bet the internet is full of it. This article is about the pay television experiments. For the photograph record video recording experiments, see Phonovision. 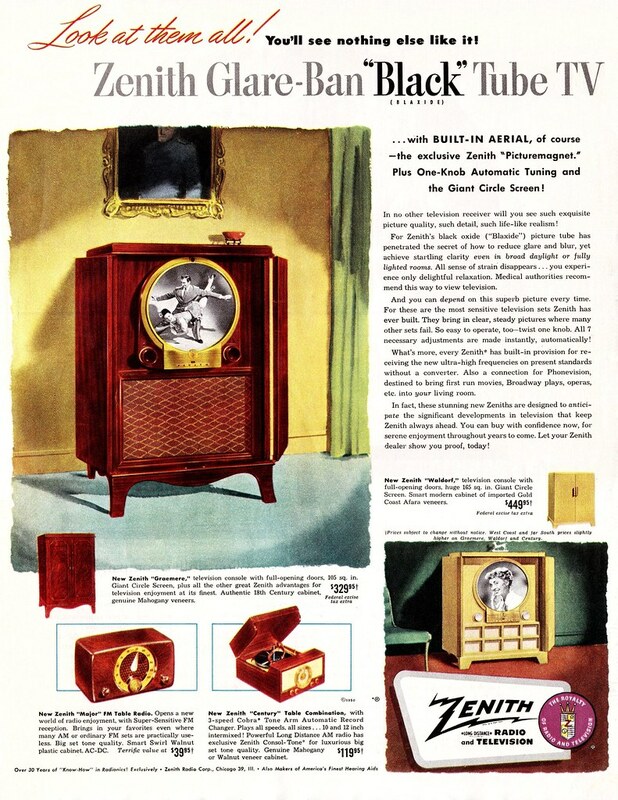 Zenith had experimented with pay television as early as 1931, believing that advertising alone could not support television broadcasting as a viable enterprise in the long term. Zenith had originally occupied television channel 1 in Chicago starting on February 2, 1939, when W9XZV went on the air. W9XZV was America's first non-mechanical television station and, until October 1940, the only television station in Chicago. Zenith's allocation was later moved to channel 2. 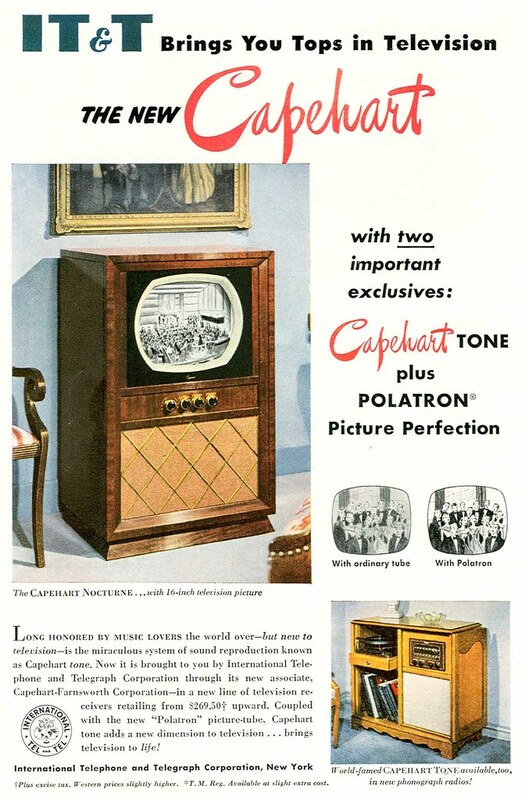 In 1947, Zenith announced a perfected pay television system and selected the name "Phonevision" as the trademark for the concept. In 1950, in preparation for the public pay television test, the experimental station moved from the Zenith factory to the Field Building and became KS2XBS. 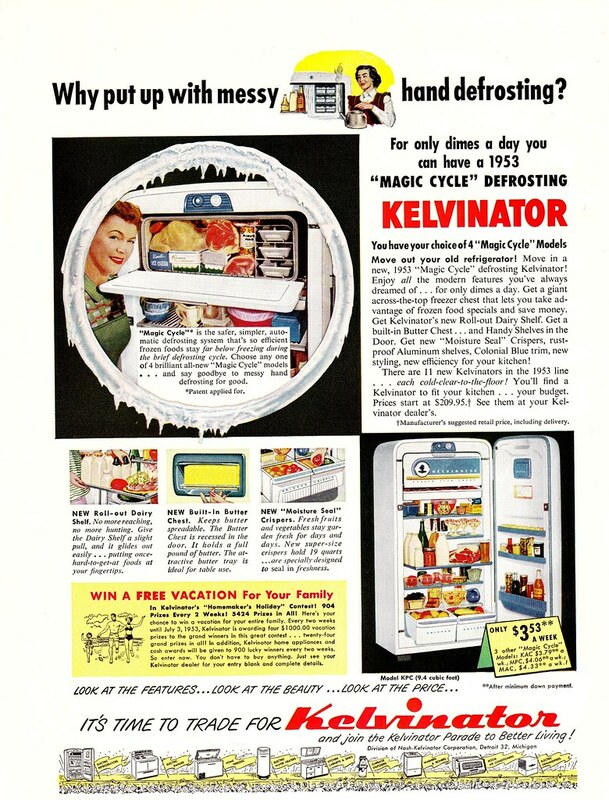 In July 1953, Zenith was forced to shut down KS2XBS when WBBM-TV was moved from channel 4 to channel 2 by the Federal Communications Commission as a side effect of channel shuffling in Michigan. The KS2XBS station's transmitter was later donated to Chicago's first educational station, PBS member station WTTW (Channel 11). 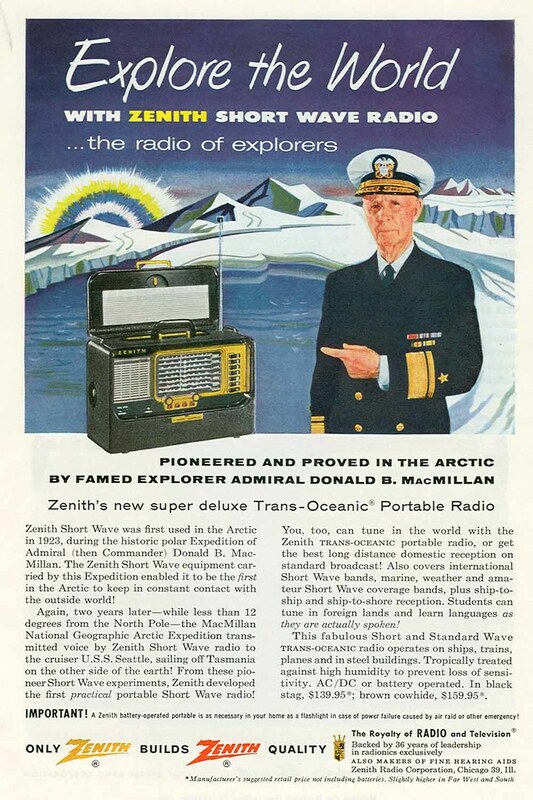 In 1954, Zenith resumed testing in the eastern United States (on WOR-TV of New York City, now WWOR-TV of Secaucus, New Jersey) and later negotiated foreign contracts in Australia and New Zealand. It also broadcast for a short time in Connecticut. In spite of its failure to gain national success, a significant amount of publicity and advertising for Phonevision was created for a short time. The Phonevision system was operational on station WHCT in Hartford, Connecticut for at least two years, ending in 1969. The station would run conventional (non-subscription) programming during the day as an "independent," and then switch to Phonevision encoded programming in the evening. The concept behind Phonevision involved making Hollywood films available to home viewers at $1 per movie (equivalent to $8.46/movie after inflation). 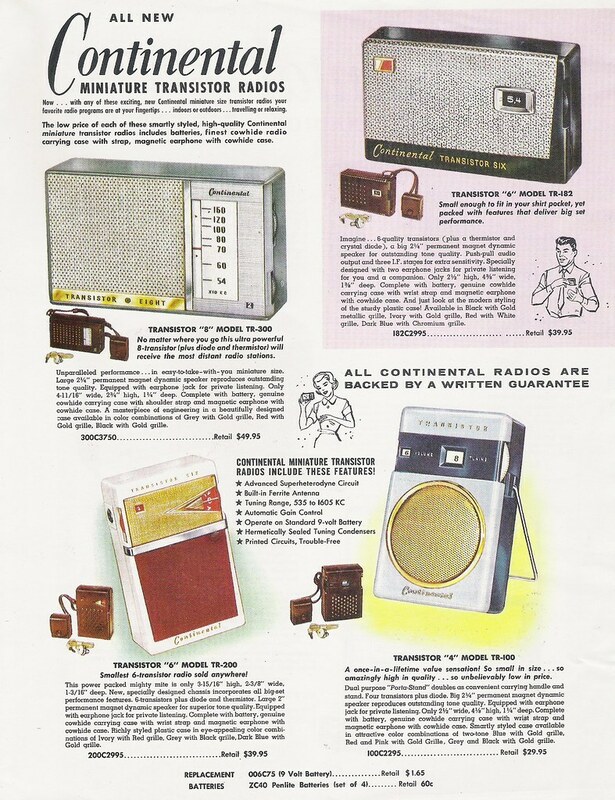 Viewers were required to purchase a descrambler unit that sat on top of the TV, plugged into the TVs antenna leads and also into the telephone line. Someone wishing to view a movie would call the Phonevision operator, who would add them to the viewer queue. A signal sent via phone lines would allow the box to descramble the signal and at the end of the month, viewers would be billed for the movie on their regular telephone bill. 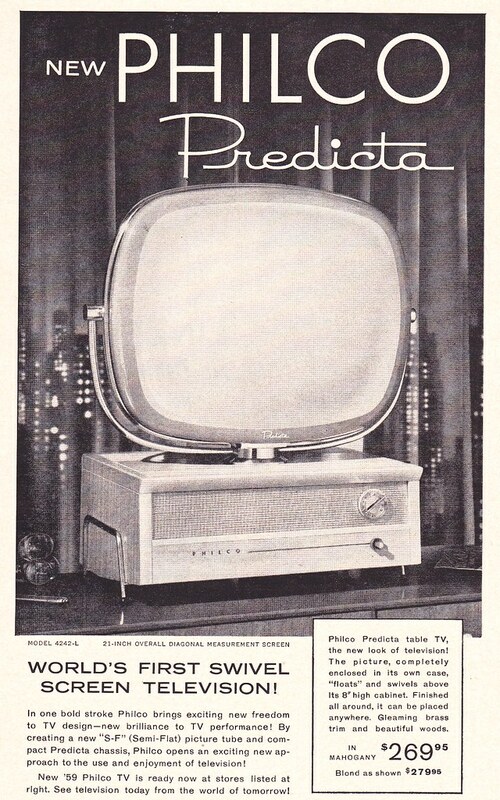 Some of Zenith's 1951 model TV sets were equipped with a special connector for Phonevision, and included a section in the owner's manual explaining the Phonevision concept, providing instructions on how to order, and a schedule for film broadcasts. The Theatre Owners of America called the service a monumental flop. However, according to then Zenith president Eugene F. McDonald, the service was a roaring success. Even though the three films initially available to the first 300 test households were more than two years old, only about 18 percent of Phonevision viewers had seen them at the movies, and 92 percent of Phonevision households reported that they would prefer to see films at home. The system operated by switching a delay line in and out of the video, which chopped the picture into slats (like looking through an open venetian blind). Half of the slats would be shifted to the right by a significant amount. Decoding reversed the process and slid the other slats over the same amount, realigning the picture. The video information was also reversed in phase, exchanging black and white. The audio was processed by "frequency inversion scrambling," shifting the audio spectrum up 2.625 kHz in frequency. This produced audio that sounded much like single sideband radio except that only high frequencies were present. Decoding of the audio was done by a dual-conversion processor. The audio was first shifted up 31.5 kHz, and then shifted down 34.125 kHz, producing a net "downshift" of 2.625 kHz. 31.5 was double the horizontal sweep frequency of 15.750 kHz, and 34.125 kHz was 13/6 ths of 15.750, giving a convenient frequency reference. The frequency tolerance was so tight that if encoded audio were recorded during a Phonevision broadcast, and then played back later into a homemade processor running on normal network programming, a slight frequency error could be detected in the restored audio. Also, when the station switched to local sync to run a local commercial, the frequency change could be heard. 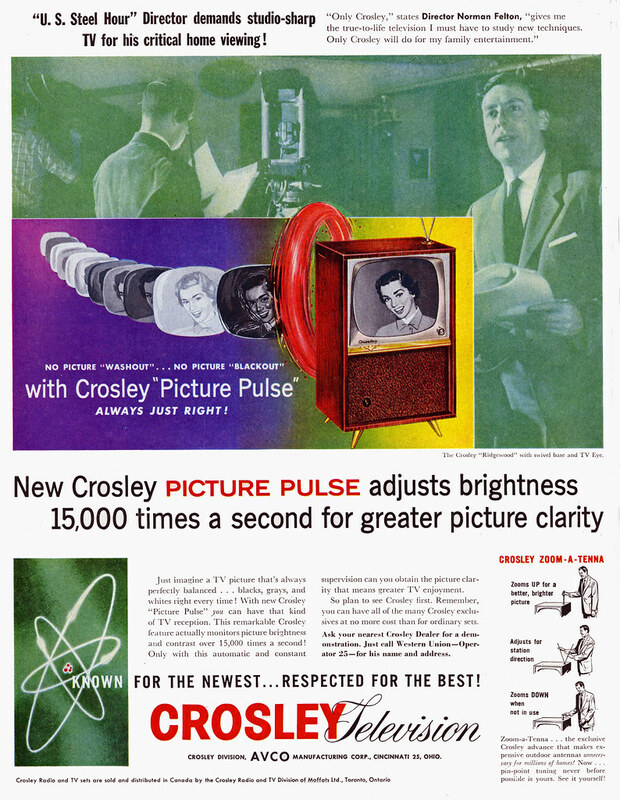 One of the major limitations of the Phonevision system was that due to the delay line being switched in and out, color could not be broadcast, as the 3.58 MHz phase lock necessary for NTSC color broadcasting could not be held. This limitation contributed to the demise of the system, along with the FCC authorization of subscription programming in 1969. Regarding those huge fridges from Admiral. I did find one at the Salvation Army. Again avocado. Complete and in good shape. I hadn't yet bought my new freezer yet - and we do entertain. 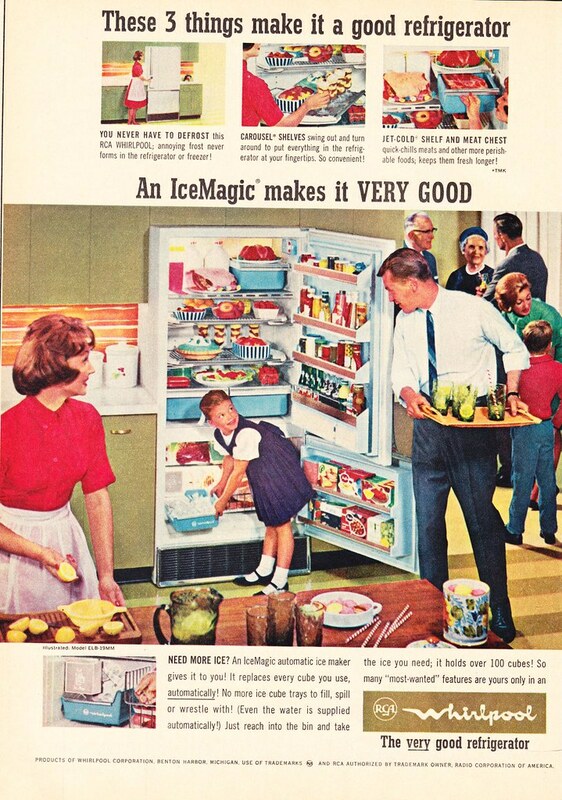 The idea of having that humongous refrigerator in the basement was reaaaly attractive to me. However, I looked at the schematic on the back. Man, that thing had a heater for EVERYTHING! It had a mullion heater, a defrost heater, a this heater, a that heater. 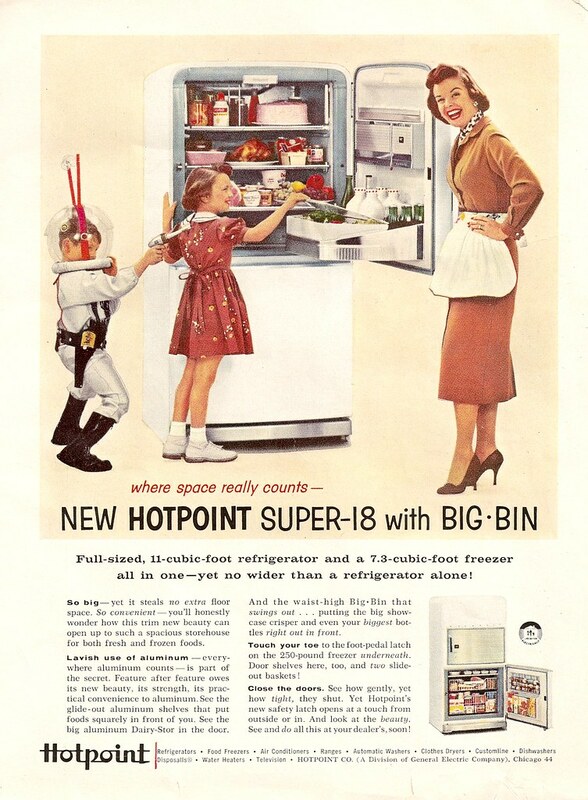 The unit was clearly the Cadillac of refrigerators but it must have sucked energy like crazy. Technically, too big a risk - but it saddened me when it finally disappeared. 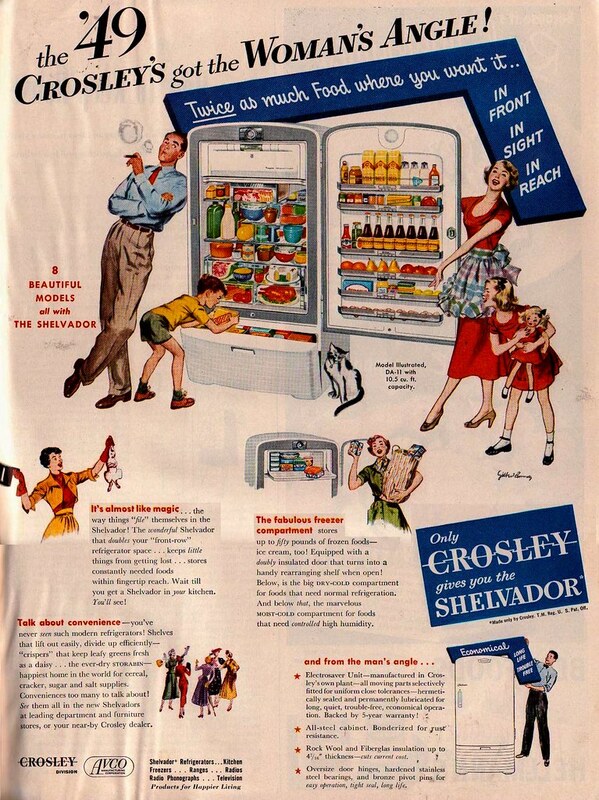 Ultimately I went out an bought a brand-new Crosley freezer - which I enjoy. 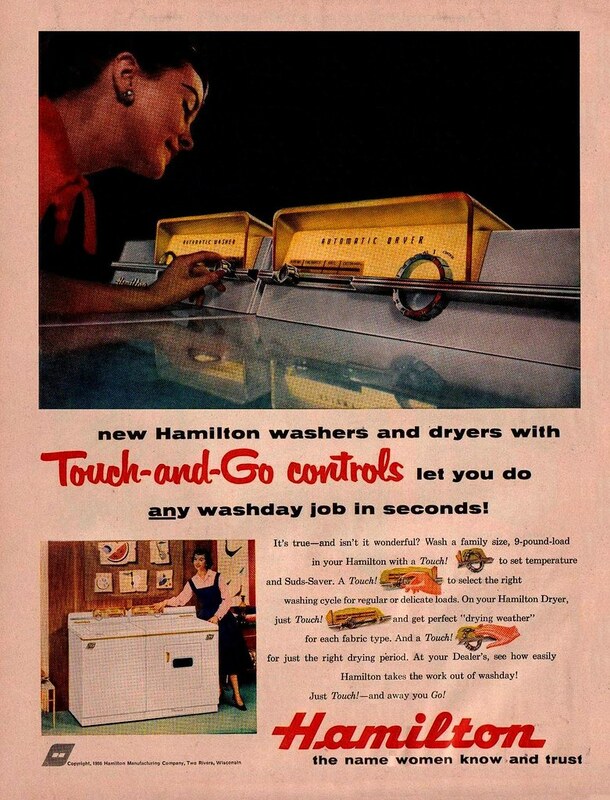 Leonard was the identical same appliance as Kelvinator, In my hometown we had a Leonard dealer and a Kelvinator dealer....I LOVE these ad's, the Halo Light is to DIE for, Sylvania ,Motorola and Zenith were very high quality sets, my Parents bought a Stromberg Carlson Hi Fi in 1952 at O.P. 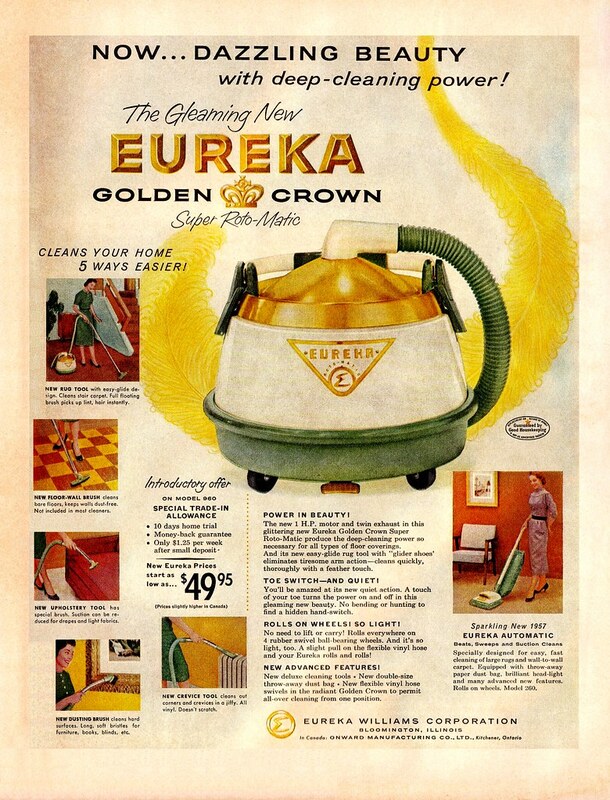 Lutz furniture in Lenoir NC, for 200.00.....this was a FORTUNE in those days, they brought home 50.00 a week between them, also the same year my Mother bought a new GE swivel top vacuum, model 815, the first swivel top, at Home Electric Co. for 99.95, which was also a fortune. 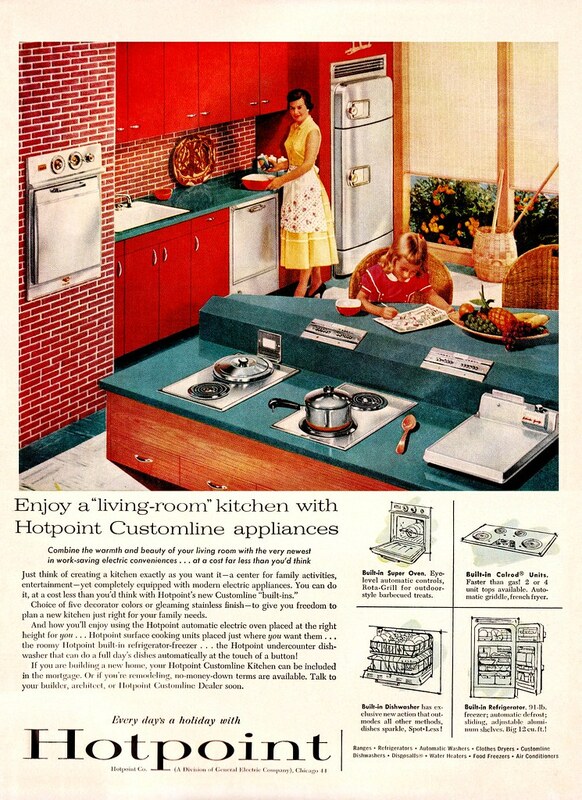 My aunt & uncle had the built-in Hotpoint appliances shown above with one difference, they had the Hotpoint fridge shown above with the polished aluminum panel on the front. 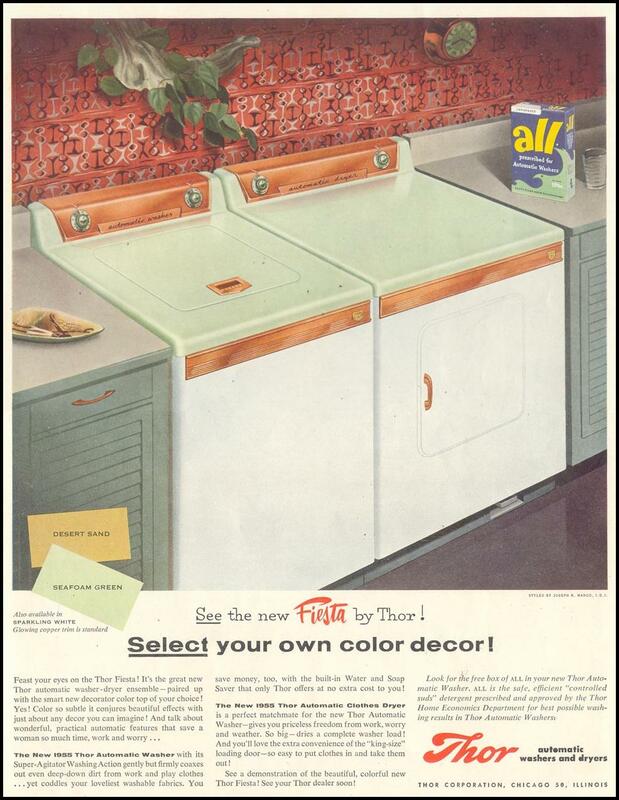 Their home was built in 1958, and the appliances were copper colored. 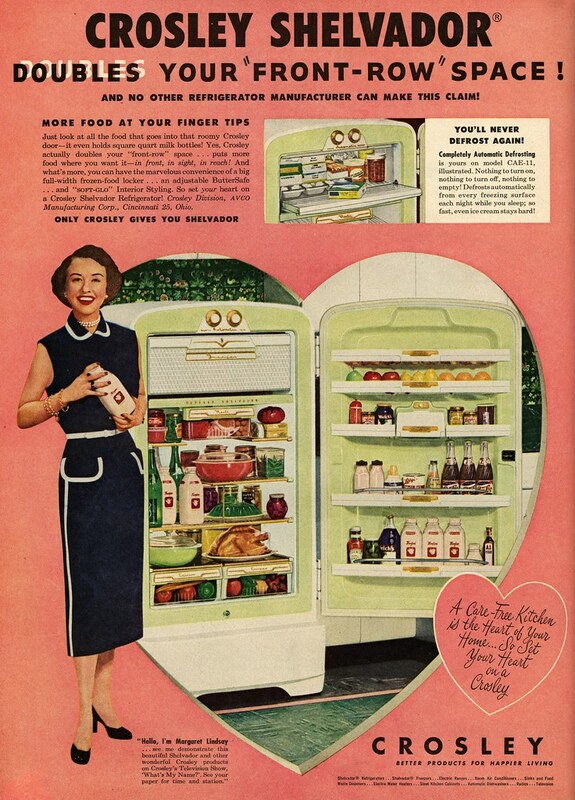 I thought that built-in fridge was the coolest thing ever, and it was a monster. In one of ads I saw a paper drinking straw. I had fogotten all about those. Remember how they would get soggy and wouldn't work anymore? Wonder if you can still buy them. I'll have to look next time I'm at the grocery store.